Arvind Sanjeev has this week unveiled a new project he has been working on which combines a baseball cap and the awesome Raspberry Pi mini PC to create a wearable computer system complete with screen. If you cannot afford to purchase the new range of Google Glass eyewear which is priced at around $1,500 you might be interested in this DIY project which creates an augmented reality and virtual reality headset for less than $80. Watch the video after the jump to learn more about the Smart Cap project and see it in action. 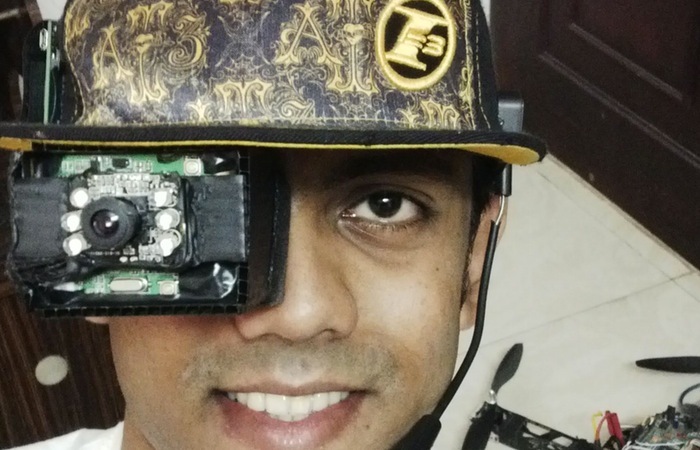 “Smart cap is a completely open DIY project consisting of a wearable head mounted display. It runs a custom voice recognition software to support hands free engagement. It can be tailored for use in helmets, first person video recording, and can mimic functionalities of a google glass for under 80$. It aims to intrigue people with the veritable wearable display technology and instructs them in detail about how they could build one of their own. In this system , in order to cope with the “Least distance of distinct vision” , which is about 15-25 cm , I have used an aspheric loupe magnifier lens having 5X magnification. For more information on the new Raspberry Pi smart cap project jump over to the Hackaday website for details and DIY hacking for more instructions. For more details on Raspberry Pi displays and HATS jump over to our essential guide.